Datasets available from the Living Atlas of the World are a valuable source for hydrologic modeling. Its seamless, national datasets are available online and can be extracted locally and used for spatial analysis without extensive preprocessing. This article describes the advantages of this workflow and a GIS tool to facilitate it that is currently under development by Cynthia V. Castro at the University of Texas. Hydrologic models are designed to provide a quantitative understanding of what happens to rain after it reaches the earth's surface by simulating rainfall-runoff processes over a watershed. Decision makers require this information to mitigate flood hazards. 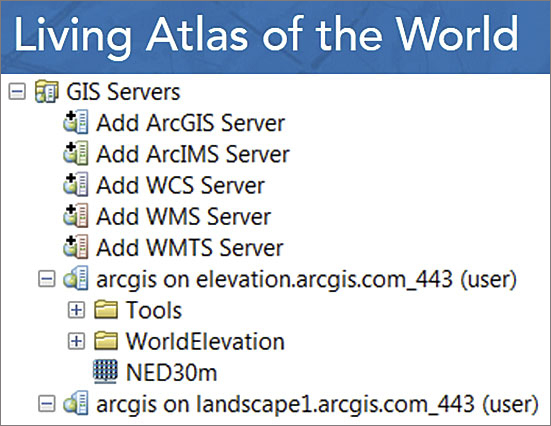 Geodata relevant to hydrologic models can be downloaded from the Living Atlas of the World. 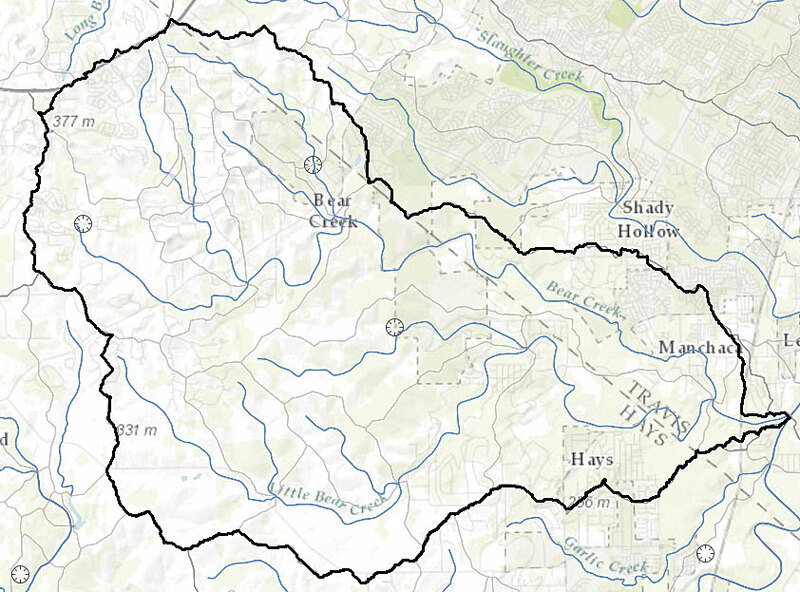 This data pertains to the Bear Creek watershed located in Hays County, Texas. 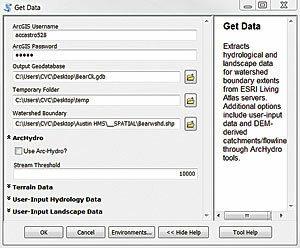 The Hydrologic Modeling System (HEC-HMS), developed by the US Army Corps of Engineers Hydrologic Center, is a widely used program for the assessment of watershed hydrology, and typical applications include urban drainage design, floodplain mapping, reservoir safety, land-use studies, and flood forecasting. GIS processing tools may be used to analyze watershed characteristics, but the speed of model development is often limited by extensive data input requirements. A fully functioning HEC-HMS model requires at least three main components to run: a meteorological model, control specifications, and a basin description. The meteorological model describes the precipitation conditions for the basin, which are usually specified from historical rainfall measurements or precipitation statistics for a given location and storm magnitude. The control specifications are simply time parameters that determine the starting and stopping point of the model simulation. 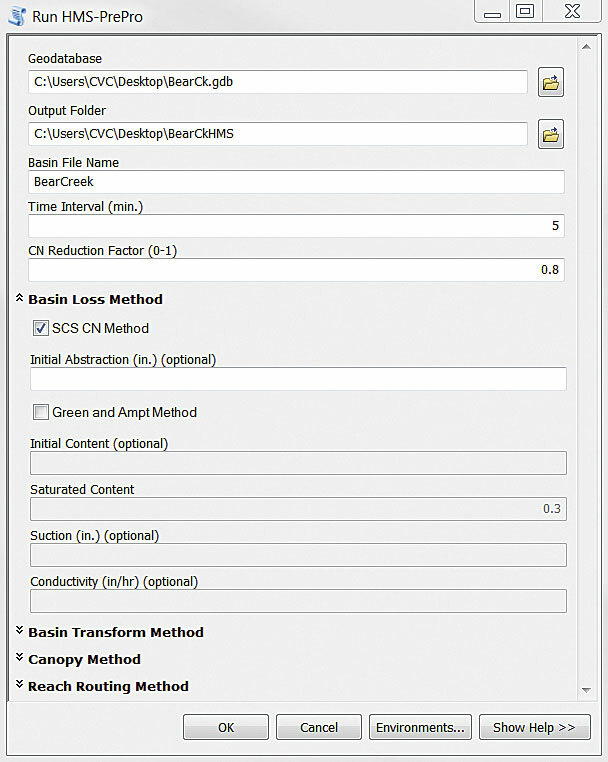 The basin component is a summary of the hydrologic elements within the model and includes connectivity information, hydrologic processes, and all parameters required to run the analysis. GIS data may be used to describe the physical properties of the watershed and populate an initial basin file. Once the preliminary model has been created, the user should refine and calibrate hydrologic parameters according to local observations. 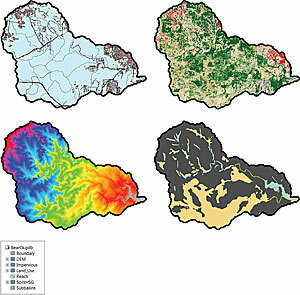 Datasets commonly used to determine the physical properties of a watershed include digital elevation, land use, impervious cover, and soil classifications. Much of this data is spread across various websites, each with unique methods for downloading and extracting information. Once obtained, the data must often be manually processed to remove seams and ensure a common coordinate system. Depending on the quality and availability of the spatial information, this data management process may require significant effort by an experienced GIS user. Whenever authoritative data is updated by government agencies, older hydrologic models become obsolete. These problems have become a major hurdle in the effort to maintain current hydrologic models across the nation. The issue is no longer with data scarcity but instead with the timely acquisition and management of data. 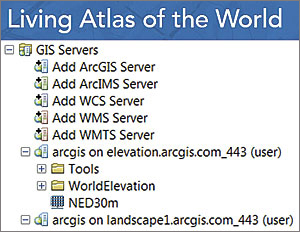 Esri's Living Atlas of the World was created to aid data management tasks by providing an operational linkage between geographic information and end users. The Living Atlas contains seamless, national datasets that may be used in common GIS processing tasks. The cloud-based data may be extracted to a local computer and immediately used in spatial operations without the need for extensive preprocessing. The United States Geological Survey (USGS) National Elevation Dataset (NED) is a seamless raster representation of the earth's terrain derived from 10-meter and 30-meter digital elevation models (DEMs) for the continental United States. Esri's Living Atlas provides a collection of the highest-resolution elevation datasets that are publicly available. The National Land Cover Database (NLCD) comprises a national land-cover classification scheme based on satellite imagery maintained by the USGS. In the Living Atlas, land-use types and percent impervious values may be obtained from the NLCD 2006 and 2011 datasets. The United States Department of Agriculture (USDA) Natural Resources Conservation Service (NRCS) maintains the SSURGO national database of soils information, which is mapped for most of the United States. SSURGO provides information pertaining to unique soil properties. The hydrologic soil groups (HSG) are commonly used for determining parameters in HEC-HMS. Traditionally, it was necessary for a user to derive the HSG from SSURGO data and reference tables. To aid data requirements for hydrologic modeling, Esri's Living Atlas provides a seamless raster dataset of SSURGO soils with HSG already populated. In addition to standard land characteristics, the Living Atlas contains national hydrography information. The USGS National Hydrography Dataset (NHD) is a GIS-based stream network containing surface water data for the continental United States. The NHD dataset was released by the USGS and the Environmental Protection Agency (EPA) and was designed as a companion dataset to the national Watershed Boundary Dataset (WBD). WBD is identified by Hydrologic Unit Codes (HUC), representing a hierarchical organization of watershed definitions (region, subregion, basin, subbasin, watershed, and subwatershed). The surface water datasets within the NHD, such as reaches, dams, and stream gauges, are related to the HUC classification scheme through GIS attributes. The NHDPlusV2.1 dataset was derived from the NHD and includes a compilation of hydrologic geospatial information from a decade-long process of merging terrain-based data with vector-based EPA streams. The NHDPlusV2.1 dataset contains approximately 2.67 million stream segments that are each connected to a unique catchment boundary. 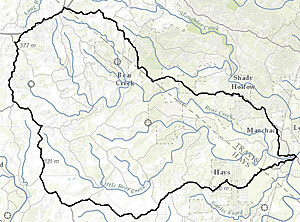 Its subbasin boundaries are geographically consistent with the national WBD watershed boundaries. Moreover, the NHDPlusV2.1 stream network is based on EPA topographic maps, USGS NLCD, and NED. By combining national land information with an established hydrologic framework (i.e., HUC), the NHDPlusV2.1 provides a nationally consistent stream network at a high resolution. HMS-PrePro is a GIS tool under development by Cynthia Castro at the University of Texas that uses Python programming to extract geospatial information from the Living Atlas of the World, a collection of ArcGIS Online layers that is curated by Esri. The extracted data is saved in a local geodatabase that is used to estimate hydrologic parameters and initialize an HEC-HMS basin model. 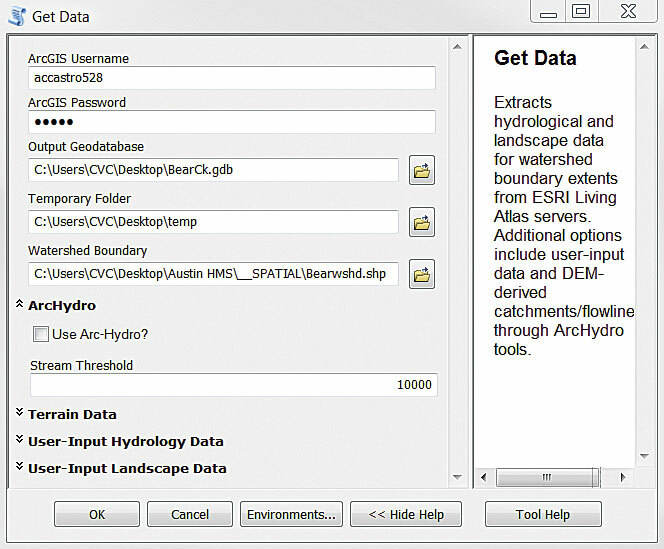 HMS-PrePro uses the watershed bounding polygon as a common denominator to connect these distinct datasets into a comprehensive hydrologic geodatabase. The data is extracted from the Living Atlas server and then preprocessed in GIS to expedite the development of models, thus bridging the gap between hydrologic data and spatial analysis. Using the Living Atlas data service, a spatial database for a watershed of interest may be created expeditiously. HMS-PrePro may also be used to combine web-based datasets with local data into a common coordinate system for increased flexibility. The Run HMS-PrePro script tool performs spatial operations on the database created by the Get Data tool. For widespread applicability, standard hydrologic methods may be chosen to represent basin abstractions, runoff transformation, and reach routing. Watershed parameters from HMS-PrePro should be treated as initial estimates and further optimized with engineering judgment, published resources, and local observations. A description of each hydrologic element is written to an ASCII file, which comprises the HEC-HMS basin model. While other GIS tools may be used for model initialization, HMS-PrePro was designed with unique data processing capabilities and a streamlined toolbox approach. Instead of requiring the user to obtain, process, and manage data for each watershed, HMS-PrePro connects to Esri's Living Atlas and extracts authoritative data in a ready-to-use format. Using the ArcPy library in Python, the tool then constructs topologically correct hydrologic networks compatible with the HEC-HMS software. 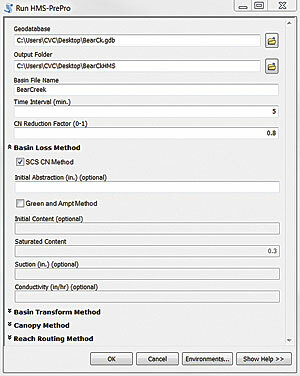 All hydrologic options are represented in just two toolbox interfaces, and common processing steps are combined for rapid execution. In HEC-GeoHMS, for example, a lengthy process is required to estimate the curve number value from land-use and soils data. The user must navigate several dozen input requests, and manual preprocessing of the data is necessary. In HMS-PrePro, spatial analysis is used to rapidly estimate the curve number value from the hydrologic geodatabase without any intermediate user steps required. HMS-PrePro and HEC-GeoHMS produce similar parameter results from the same set of input data. Instead of representing physical processes through labor-intensive data subsistence, it is possible to characterize watershed hydrology through an information-based GIS cloud environment. Connecting the Living Atlas with HEC-HMS allows modelers to continue working with familiar tools but with much greater speed and consistency. The improved GIS technology provides much-needed operational links between raw hydrologic data and average end users. With data from the Living Atlas, GIS preprocessors may significantly enhance efforts associated with flood modeling for decision-making purposes. For more information on HMS-PrePro, contact Cynthia V. Castero.